Received May 13, 2018; Accepted May 21, 2018.; Published online June 25, 2018. Upregulation of human telomerase reverse transcriptase (hTERT) expression is an important factor in the cellular survival and cancer. Although growing evidence suggests that hTERT inhibits cellular apoptosis by telomere-independent functions, the mechanisms involved are not fully understood. Here, we show that hTERT contains a BH3-like motif, a short peptide sequence found in BCL-2 family proteins, and interacts with anti-apoptotic BCL-2 family proteins MCL-1 and BCL-xL, suggesting a functional link between hTERT and the mitochondrial pathway of apoptosis. Additionally, we propose that hTERT can be categorized into the atypical BH3-only proteins that promote cellular survival, possibly due to the non-canonical interaction between hTERT and antiapoptotic proteins. 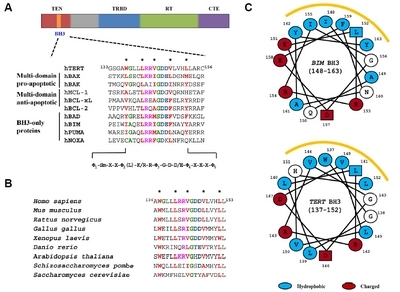 Although the detailed mechanisms underlying the hTERT BH3-like motif functions and interactions between hTERT and BCL-2 family proteins have not been elucidated, this work proposes a possible connection between hTERT and BCL-2 family members and reconsiders the role of the BH3-like motif as an interaction motif. Human telomerase is a ribonucleoprotein complex composed of a telomerase catalytic subunit (hTERT) and an RNA component (hTR) that adds hexameric repeats to the end of chromosomes (Blackburn, 1992). In human somatic cells, telomerase activity is strongly suppressed and progressive shortening of telomeres with age leads to cellular senescence and apoptotic cell death (Shay et al., 2001). However, some highly proliferative cells, such as germline and stem cells, exhibit stable telomere length through maintenance of telomerase expression and activity (Kim et al., 1994). High telomerase activity in somatic cells, associated with cell cycle deregulation, may be important for cancer initiation and progression (Blasco et al., 1997; Landberg et al., 1997). In approximately 90% of cancers, telomerase is re-expressed and accounts for telomere maintenance (Kim et al., 1994), suggesting that inhibition of telomerase may be an attractive anti-cancer strategy. Accumulating evidence demonstrates that hTERT promotes cellular and organismal survival, independent of telomere lengthening—the canonical function of hTERT. We previously reported that hTERT has a protective effect against staurosporine- (STS) (Lee et al., 2008) or N-methyl-D-aspartic acid (NMDA)-induced cell death (Kang et al., 2004; Lee et al., 2008). Using mouse telomerase reverse transcriptase (mTERT) transgenic mice lacking mouse telomerase RNA component (mTR) expression, we demonstrated that the anti-apoptotic effect of hTERT is unrelated to its known enzymatic activity in vivo (Lee et al., 2008). Several independent groups also demonstrated the ability of hTERT to promote cellular survival in response to apoptotic stimuli (Cao et al., 2002; Massard et al., 2006; Rahman et al., 2005; Zhang et al., 2017). Additionally, MYC can regulate apoptosis and TERT can regulate MYC-dependent oncogenesis independently of its telomerase activity in vivo (Koh et al., 2015); however, the precise mechanisms remain unclear. It has been suggested that the anti-apoptotic effect of hTERT is related to inhibition of the intrinsic apoptosis pathway upon apoptotic stimuli (Del Bufalo et al., 2005; Lee et al., 2008; Massard et al., 2006; Zhang et al., 2017); however, a convincing direct link between hTERT and the intrinsic apoptosis pathway has not yet been demonstrated. Proteins of the BCL-2 family play a critical role in regulating the mitochondrial pathway of intrinsic apoptosis by controlling mitochondrial outer membrane permeabilization (MOMP) (Chipuk and Green, 2008). Members of the BCL-2 family can be divided into three functional groups, antiapoptotic proteins, pro-apoptotic effectors, and BH3-only proteins (Hardwick and Soane, 2013). They contain at least one of four conserved BCL-2 homology (BH) domains designated BH1, BH2, BH3, and BH4, which correspond to alpha-helical segments (Reed, 1997). The multidomain proapoptotic effectors, BAX or BAK, are required for mitochondrial apoptosis initiation, resulting in the release of cytochrome c from mitochondria. However, the anti-apoptotic proteins of the BCL-2 family directly bind to pro-apoptotic effectors and tightly regulate the balance between cellular life and death decisions. BH3-only proteins, which contain a single BH3 motif, can directly activate pro-apoptotic proteins (BAX and BAK) or inhibit anti-apoptotic proteins (BCL-2, BCL-xL, MCL-1, and BCL-w) by competitively disrupting the interaction between pro-apoptotic effectors and antiapoptotic proteins (Hardwick and Soane, 2013). Importantly, identification of a novel BH-only protein, AVEN, by bioinformatics and computational biology suggests the existence of a distinct subclass of a functional BH3-only protein as an apoptosis inhibitor which interacts and stabilizes BCL-xL (Hawley et al., 2012). In this report, we identified a BH3-like motif within the telomerase essential N-terminal (TEN) domain of hTERT. Since the BH3 motif is an amphipathic alpha-helix that is present in both pro- and anti-apoptotic proteins and binds to the hydrophobic grooves of anti-apoptotic proteins (Kvansakul and Hinds, 2013; Moldoveanu et al., 2014), we found that hTERT can interact with anti-apoptotic BCL-2 proteins MCL-1 and BCL-xL. Furthermore, we explored whether the BH3-like motif of hTERT can affect interactions between hTERT and anti-apoptotic protein MCL-1. A mutagenesis study revealed that hTERT interacts with anti-apoptotic protein MCL-1, through both BH3-dependent and independent mechanisms. Thus, the non-canonical interaction between hTERT and anti-apoptotic proteins may regulate hTERT protective effects in contrast to typical BH3-only proteins which induce cellular apoptosis. Besides, we showed that hTERT does not modulate the interactions of BCL-xL/BAX complex, frequently involved in the death-promoting function of BH3-only proteins. Although we could not determine the physiological outputs and pathological effects of the interaction between hTERT and BCL-2 family proteins, we suggest that hTERT is a novel BH3-containing protein which belongs to the atypical subclass of a BH3-like motif and interacts with BCL-2 family members. HEK 293T/17, U2OS, and HeLa cells were obtained from the American Type Culture Collection (ATCC). Cells were grown in dishes until confluency and then trypsinized, washed, and resuspended in high-glucose Dulbecco’s modified Eagle’s medium (DMEM) supplemented with 10% fetal bovine serum (FBS), 100 units/ml penicillin, and 100 μg/ml streptomycin (Gibco). Cells were incubated at 37°C and 5% CO2 in a humidified incubator. pCMV-hBCL-2 plasmid was obtained from the Korea Human Gene Bank (KHGB). To generate expression plasmids for N-terminal 3× FLAG-tagged, 3× MYC-tagged, or 3× HA-tagged proteins, the full-length coding sequence of target proteins was amplified from cDNA by PCR using the Herculase II Fusion DNA Polymerase (Agilent Technologies). PCR products were digested with engineered EcoRI and XbaI sites and the resulting PCR fragments were cloned into 3× FLAG-pCS4, 3× MYC-pCS4, or 3× HA-pCS4 vectors. All cloned constructs were confirmed by DNA sequencing. TRAP assay was performed as described previously (Lee et al., 2008) with slight modifications. In brief, U2OS cells were transiently co-transfected with pBS-TER (hTR) and the indicated plasmids using Lipofectamine 3000 (Thermo Fisher Scientific) according to manufacturer’s instructions. Cells were then lysed in CHAPS buffer for 30 min on ice. After centrifugation (14,000 × g for 20 min at 4°C), the resulting supernatant was subjected to a TRAP reaction with a TS primer (5′-AATCCGTCGAGCAGAGTT-3′). The TRAP reaction was performed at 25°C for 30 min, followed by PCR amplification. PCR was performed with the TS and CX (5′-GCGCGGCTTACCCTTACCCTTACCCTAACC-3′) primer, using the following conditions: 95°C for 30 s, 52°C for 30 s, 72°C for 30 s, for 28 cycles. The resulting PCR products were resolved on a 12.5% nondenaturing acrylamide gel and stained with the silver staining method. HEK 293T/17 cells seeded on 100-mm plates were transiently transfected with the indicated expression plasmids using the polyethylenimine (PEI) transfection method (Longo et al., 2013). One day following transfection (24 h), the cells were harvested for co-immunoprecipitation assays. Briefly, the cells were washed once with phosphate buffered saline and lysed in 1 ml of lysis buffer (50 mM Tris pH 7.4, 150 mM NaCl, 0.5% Triton X-100, 1 mM EDTA, and protease cocktail inhibitor) or immunoprecipitation-TRAP lysis buffer (10 mM Tris pH 7.4, 1 mM MgCl2, 1 mM EDTA, 0.5% NP-40, 10% Glycerol, 5 mM β-Mercaptoethanol, and protease cocktail inhibitor). An aliquot of each cell lysate was subjected to SDS-PAGE for determining protein expression by western blot analysis. The remaining lysates were subjected to immunoprecipitation. Lysates were incubated with 1 μg of indicated antibodies for 2 h and then mixed with 30 μl of a 50% slurry of protein G-agarose (Invitrogen) for a further 2 h at 4°C. In the case of FLAG immunoprecipitation, anti-FLAG antibodies bound to protein G magnetic beads (Sigma Aldrich) were added to the remaining lysates for 3 h at 4°C. The beads were washed twice with lysis buffer and resuspended in 2× SDS sample buffer. The resulting products were resolved by SDS-PAGE. For TRAP assay, the beads were recovered by immunoprecipitation-TRAP lysis buffer after washing steps and then subjected to a TRAP reaction. Western blotting was performed as described previously (Xie et al., 2017) with slight modifications. Cell pellets were resuspended in lysis buffer (50 mM Tris pH 7.4, 150 mM NaCl, 0.5% Triton X-100, 1mM EDTA pH 8.0, and protease cocktail inhibitor). Soluble extracts were prepared by centrifugation (14,000 × g for 20 min at 4°C). Cell lysates were separated by 6–15% SDS-PAGE and then transferred to nitrocellulose membranes (GE Healthcare). Membranes were blocked for 1 h with 3% dried skim milk in TBST (50 mM Tris pH 8.0, 150 mM NaCl, and 0.5% Tween 20) and incubated with the following primary antibodies, anti-HA (Santa Cruz, sc-805), anti-FLAG (Sigma Aldrich, F1804), anti-MYC (Cell Signaling, #2276), anti-BCL-xL (Cell Signaling, #2764), anti-MCL-1 (Santa Cruz, sc-819), anti-ACTIN (Santa Cruz, sc-47778), anti-GAPDH (Santa Cruz, sc-32233), anti-BCL2 (Santa Cruz, sc-7382), anti-BAX (Santa Cruz, sc-493), and anti-PARP1 (Santa Cruz, sc-7150). After incubation with primary antibodies, the membranes were incubated with the appropriate peroxidase-conjugated secondary antibodies (GeneDEPOT, USA). Protein expression was detected by enhanced chemiluminescence (ECL) reagents and LAS-3000 image analyzer (Fujifilm, Japan). For fluorescence microscopy, Transfected HEK293T/17 cells were grown on cover slips in 12-well plates. The cells were fixed with 4% paraformaldehyde for 15 min at room temperature, washed with PBS twice, permeabilized with 0.5% Triton X-100 in PBS for 15 min, and then blocked in 5% bovine serum albumin for 30 min. All samples were incubated with indicated antibodies in blocking buffer for 2 h and followed by the secondary antibody for 1 h at room temperature. The samples were mounted with fluorescence mounting medium containing DAPI (Abcam, ab104139) and observed by LSM 880 Zeiss confocal microscope (Zeiss). To investigate how hTERT can regulate cellular apoptosis through a telomere length-independent mechanism, we first contemplated previous findings on the protective effects of hTERT against apoptotic stimuli. Of those, several papers suggested that anti-apoptotic function of hTERT might be related to the mitochondrial death pathway (Del Bufalo et al., 2005; Lee et al., 2008; Massard et al., 2006; Zhang et al., 2017). It was also observed that overexpression of hTERT suppresses BCL-2-dependent apoptosis (Del Bufalo et al., 2005). Based on reported evidence, we decided to investigate the role of hTERT at the mitochondrial level. We first analyzed the primary sequence of hTERT to determine its subcellular localization or specific protein-protein interactions. This analysis led us to the identification of a BH3-like motif, a short peptide sequence found in the BCL-2 protein family. Although the BH3 sequence has not been rigorously confirmed due to its divergent evolution (Aouacheria et al., 2013), it is commonly defined by a sequence identity of L-X(3)-G-D (X designates any amino acid) (Aouacheria et al., 2013; 2015) or by conserved hydrophobic residues responsible for contact with interaction pockets (Chipuk et al., 2010; Czabotar et al., 2014; Herman et al., 2008; Westphal et al., 2014). Using these criteria, we identified a BH3-like region at residues 133–156 within the hTERT N-terminal sharing a highly conserved sequence with MCL-1 BH3 (Fig. 1A). The existence of a BH3 motif suggests that this region of hTERT may be important for interaction with BCL-2 family proteins. To identify if the hTERT BH3-like motif is conserved among species, we compared phylogenetic homology sequences starting from Saccharomyces cerevisiae to humans. Interestingly, alignment of the hTERT BH3-like motif between species revealed that this sequence is well-conserved from Xenopus laevis to humans (Fig. 1B). Similar to the hTERT BH3-like motif, the N-terminal mitochondrial targeting sequence was found to be conserved in higher eukaryotes, such as plants and mammals (Santos et al., 2004). Thus, the N-terminus of hTERT may contain evolutionarily significant regions for mitochondrial functions. Protein secondary structure prediction of the hTERT Nterminal region—based on Tetrahymena thermophile crystal structures and JPred3 software (Cole et al., 2008)—revealed that a region corresponding to the putative BH3 motif of humans might form an alpha-helix (Jacobs et al., 2006; Schmidt et al., 2014). A helical wheel diagram of the hTERT BH3-like motif (amino acids 137–152) illustrated that there are five conserved hydrophobic sites composed of W137, L141, V144, V148, and L152, as well as a conserved oppositely charged residue (D146) similar to that of the BH3-only protein, BIM (Fig. 1C). Conserved hydrophobic residues of the amphipathic helix of BH3-only proteins bind to hydrophobic pockets in the surface groove of anti-apoptotic BCL-2 proteins (Chipuk et al., 2010; Herman et al., 2008), while the Asp residue forms a salt bridge with the conserved Arg residue of the BH1 domain of pro-survival proteins (Czabotar et al., 2014). These results suggest that hTERT contains a BH3-like motif satisfying the minimum requirements for an interaction with BH3-binding grooves of anti-apoptotic proteins. Based on the identification of the BH3 motif in hTERT, we hypothesized that hTERT might be able to interact with BCL-2 family members. To assess this hypothesis, we first performed a co-immunoprecipitation (co-IP) assay with hTERT and anti-apoptotic BCL-2 proteins. Previous reports suggested that the BH3 motif of BH3-only proteins mostly interact with anti-apoptotic BCL-2 proteins (Shamas-Din et al., 2011). HEK 293T/17 cells were transiently transfected with tagged-constructs of wild-type (WT) hTERT and either BCL-xL or MCL-1. As expected, co-IP assay revealed that hTERT interacts with anti-apoptotic BCL-xL and MCL-1 (Fig. 2A). A reciprocal co-IP assay also confirmed that hTERT can be found in BCL-xL and MCL-1 precipitates (Fig. 2B). hTERT was apparently co-localized with MCL-1 in HEK 293T/17 cells (Supplementary Fig. S1A). Additionally, we detected telomerase activity from the cell extracts subjected to immunoprecipitation with endogenous MCL-1 and BCL-xL antibodies (Supplementary Fig. S1B), indicating that hTERT can endogenously associate with anti-apoptotic BCL-2 proteins in living cells. We next determined the requirement of the hTERT BH3-like motif in mediating hTERT-MCL-1 interactions. After generating truncated hTERT constructs corresponding to the TEN domain (amino acids 1–355), TERT RNA binding domain (TRBD, amino acids 320–604), reverse transcriptase domain (RT, amino acids 595–946), and C-terminal extension domain (CTE, amino acids 940–1132), we performed domain mapping analyses (Fig. 1A). Mapping analyses for hTERT interaction domains with the MCL-1 protein indicated that hTERT fragments of both amino acids 1–355 and 595–946 contribute to MCL-1 interactions, corresponding to the TEN and RT domains of hTERT, respectively (Fig. 2C). To further characterize the interaction between hTERT and MCL-1, a series of hTERT BH3 mutants were created. The conserved Leu, Gly, and Asp residues of BH3-only proteins were previously reported as critical for interactions with antiapoptotic proteins (Czabotar et al., 2007; Maiuri et al., 2007b; Zha et al., 1997). Consistent with previous data, each amino acid substitution mutation of the hTERT BH3-like motif weakened its interaction with MCL-1, although it did not completely abrogate the interaction (Fig. 2D). Similar results were obtained when the experiments were repeated with a deletion mutant that lacks amino acids 137–148 of the BH3-like motif (data not shown). In line with their binding abilities to MCL-1, hTERT also interacted with BCL-xL through both TEN and RT domains (Supplementary Fig. S1C). Taken together, the results suggest that hTERT can interact with the anti-apoptotic protein MCL-1 through both BH3-dependent and independent mechanisms. We next examined whether hTERT interacts with BH3-only proteins or multidomain pro-apoptotic proteins. Despite sharing BH3 motif sequence homology, some BH3-only proteins can selectively bind to pro-apoptotic proteins or other BH3-only proteins (Choi et al., 2012; Rodolfo et al., 2004; Tan et al., 2001). The interaction between hTERT and BH3-only proteins or pro-apoptotic proteins was validated by co-IP analysis. Notably, we observed that hTERT was co-precipitated with BH3-only proteins BAD and BECN1 (Figs. 3A and 3B), suggesting that hTERT might interact with various BCL-2 family members. To further examine the BECN1 region responsible for interactions with hTERT, we generated constructs expressing BECN1 domains. BECN1 is reported to consist of three domains, the BH3 domain (amino acids 1–140), coiled-coil domain (amino acids 141–277), and evolutionarily conserved domain (amino acids 245–450) (Wirawan et al., 2012). In particular, we found that hTERT binds to the coiled-coil domain of BECN1, which serves as an interaction platform for Atg14L or UVRAG to regulate autophagy (Fig. 3C) (Matsunaga et al., 2009). Interestingly, binding of hTERT and pro-apoptotic members BAK or BAX was not detected in our conditions (data not shown). Based on the above data, it appears that hTERT can transiently interact with BCL-xL or MCL-1 and that the BH3-like motif is conserved in higher eukaryotes. The TEN domain of hTERT, containing the putative BH3 motif, is known to be important in the catalysis of telomeric repeat addition (Jacobs et al., 2006; Steczkiewicz et al., 2011). Previous analysis of yeast TERT (Est2p) N-terminal region suggested that point mutations of residues corresponding to the BH3-like motif of hTERT exhibit low or undetectable levels of telomerase activity and shortening of telomeres, leading to yeast senescence (Xia et al., 2000). However, the significance of BH3-like motif residues and function has not yet been investigated in higher eukaryotes. Therefore, we tested if the BH3-like motif is important for telomerase activity. The MCL-1 binding-defective hTERT mutants (L141A, G145E, and D146A) can directly address the effect of BH3-dependent interactions between hTERT and MCL-1 on telomerase activity. We transfected telomerase-negative U2OS cells with hTERT BH3 mutants and examined telomerase activity by telomeric repeated amplification protocol (TRAP) assays. Unexpectedly, among the hTERT BH3 mutants tested, only the deletion mutant that lacks amino acids 137–148 of the BH3-like motif resulted in severe reduction of telomerase activity (Fig. 4A). The substitution mutants (L141A, G145E, and D146A) showed a marginal effect on telomerase activity, inconsistent with previous data from yeast TERT (Xia et al., 2000). These results imply that the BH3-like residues 137–148 likely maintain telomerase activity regardless of MCL-1 association. In cancer cells, stable overexpression of anti-apoptotic BCL-2 has been shown to increase telomerase activity (Mandal and Kumar, 1997). Moreover, we observed that the RT domain of hTERT contributes to its interactions with BCL-xL and MCL-1. To examine the relationship between telomerase activity and the BCL-2 family proteins, HeLa and HEK 293T/17 cells were transiently transfected with BCL-xL or MCL-1 constructs. After 48 h, cell lysates were analyzed by TRAP assays to detect telomerase activity. We did not observe any significant changes in telomerase activity after ectopic expression of BCL-xL and MCL-1 (Fig. 4B, Supplementary Fig. S2); therefore, we concluded that their transient expression does not regulate telomerase activity in cancer cells. We previously demonstrated that hTERT protects cellular apoptosis upon STS treatment regardless of telomere elongation activity and suggested that this observed protective effect of hTERT may be a consequence of mitochondrial death pathway suppression (Lee et al., 2008). The observed interaction between hTERT and BCL-2 family members led us to hypothesize that the protective effect of hTERT in response to apoptotic stimuli might arise from regulation of BCL-2 family members. The stability of anti-apoptotic proteins has been described as a relevant step for anti-apoptotic potency (Rooswinkel et al., 2014); therefore, we first examined the change in BCL-2 family protein levels upon STS treatment. As shown in Fig. 5A, STS significantly decreased protein levels of MCL-1, a key regulator of apoptosis, after 4 h of treatment as previously reported (Iglesias-Serret et al., 2003); however, BCL-xL and BAX protein levels were not profoundly changed. MCL-1 is required to be eliminated for apoptosis to proceed and the protein has a short half-life that is unique among BCL-2 family members (Iglesias-Serret et al., 2003; Nijhawan et al., 2003). In addition, we also confirmed that decreased level of MCL-1 is dependent on both transcriptional and translational regulations following STS treatment (Figs. 5B and 5C). To determine if the protective effect of hTERT is related to MCL-1 degradation, we transfected HEK 293T/17 cells with hTERT and observed MCL-1 protein turnover upon STS treatment. Overexpression of hTERT did not affect MCL-1 protein levels (Fig. 5D), indicating that hTERT inhibits STS-induced apoptosis mainly through a different action mechanism, beyond MCL-1 stabilization. Recent studies showed that BCL-xL inhibits BAX-dependent apoptosis by constant retro-translocation of BAX from the mitochondria into the cytosol (Edlich et al., 2011). Since STS treatment also induces cellular apoptosis by promoting translocation of BAX to the mitochondria (Lin et al., 2010), we tested if overexpression of hTERT affects BCL-xL and BAX interaction. Additionally, the presence of an hTERT BH-like motif provoked interest since this short peptide motif can act as a death signal by displacing BAX/BCL-xL heterodimers (Chipuk and Green, 2008; Chipuk et al., 2010). HEK 293T/17 cells were transfected with FLAG-tagged BCL-xL and MYC-tagged hTERT, followed by co-IP of endogenous BAX under different detergent conditions. It is known that various detergents can alter BAX conformation, inducing the exposure of the N-terminal epitope (Edlich et al., 2011; Hsu and Youle, 1997), which is required for BCL-xL interaction in the mitochondria (Edlich et al., 2011). We found that hTERT does not alter the BAX/BCL-xL ratio in the presence of either Triton X-100 or CHAPS (Fig. 6A). 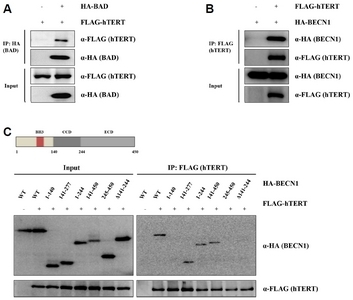 The BH3-only protein BAD can form a heterodimer with BCL-xL, triggering apoptosis in a BAX-dependent manner by displacing BAX/BCL-xL heterodimers (Yang et al., 1995); therefore, we next examined if hTERT indirectly regulates BAX/BCL-xL heterodimers through BAD, which also transiently interacts with hTERT (Fig. 3A). Although ectopic expression of HA-tagged BAD can abolish the interaction between endogenous BAX and FLAG-tagged BCL-xL, we did not detect significant changes in BAX/BCL-xL heterodimers ratios (Fig. 6B). Additionally, we did not observe an obvious difference in BAK/MCL-1 heterodimers after hTERT overexpression (Fig. 6C). These results suggest that hTERT does not directly modulate cellular survival through mediation of BAX/BCL-xL or BAK/MCL-1 complex interactions. Nevertheless, we cannot preclude the possibility that hTERT regulates its anti-apoptotic function by regulating other BCL-2 members or by controlling other MCL-1 or BCL-xL functions related to cellular survival (Perciavalle et al., 2012). We further investigated if hTERT can alter BECN1/BCL-xL interactions, similar to other BH3-only proteins. BH3-only proteins can regulate autophagy by disrupting the BECN1/BCL-xL complex (Maiuri et al., 2007a). Additionally, it was recently shown that telomerase activates autophagy mediated by mTOR signaling under acute kidney injury (Harris and Cheng, 2016). However, the BECN1/BCL-xL complex interaction was not affected by hTERT expression (Fig. 6D). The data suggest that hTERT may regulate the BECN1 complex through the coiled-coil domain and not the BH3 domain (Fig 4C). Although we do not possess clear evidence regarding the effects of hTERT and BCL-2 family protein interactions on autophagy and apoptosis, we suggest that hTERT contains a BH3-like motif that contributes to interact with MCL-1 and BCL-xL and acts as an atypical BH3-only protein that promotes cellular survival. Human telomerase reverse transcriptase (hTERT) is a 127-kDa protein with four domains and several evolutionarily conserved motifs. Although several groups have reported non-canonical functions of hTERT, searching for novel non-telomeric motifs within the conserved domain has been mostly overlooked. In the present study, we report that hTERT has a BH3-like motif within the TEN domain of the Nterminal region. It was previously demonstrated that hTERT is translocated from the nucleus to the mitochondria following oxidative stress or chemical treatments (Ahmed et al., 2008; Haendeler et al., 2003; 2009; Zhang et al., 2017). This finding led to the discovery of a protective role for hTERT in mitochondria (Ahmed et al., 2008; Haendeler et al., 2003; 2009; Massard et al., 2006) and it was shown that hTERT has a mitochondrial targeting sequence in its N-terminal region (Santos et al., 2004). Additionally, mitochondrial TERT interacts with the RNA component of mitochondrial RNA processing endoribonuclease (RMRP) to regulate RNA-dependent RNA polymerase (RdRP) activity (Maida et al., 2009) or act as an hTR-independent reverse transcriptase in mitochondria (Sharma et al., 2012). Since nuclear exclusion of hTERT plays a critical role in apoptosis, senescence, and mitochondrial function (Ahmed et al., 2008; Saretzki, 2009), the identification of a BH3-like motif supports the notion that hTERT may be strongly associated with the intrinsic apoptotic pathway or mitochondrial functions. We previously reported an anti-apoptotic effect of TERT in vivo using mTERT transgenic mice and mTR knockout mice (Lee et al., 2008). Moreover, several papers have suggested that the anti-apoptotic function of hTERT might depend on the BCL-2 family. hTERT overexpression inhibits translocation of BAX to the mitochondria upon oxidative stress (Indran et al., 2011) and BCL-2-dependent apoptosis (Del Bufalo et al., 2005), independently of telomerase activity. Furthermore, depletion of hTERT sensitized cellular apoptosis by decreasing expression levels of anti-apoptotic protein BCL-2 (Wang et al., 2012) and facilitating the activation of pro-apoptotic protein BAX via conformational changes (Massard et al., 2006). However, finding that hTERT possesses a putative BH3 binding motif was unexpected. Since the BH3 motif is known to regulate intrinsic apoptosis through BCL-2 family interactions, the existence of a BH3-like motif in hTERT provides biological evidence linking it to BCL-2 family-mediated functions. We showed that hTERT can interact with antiapoptotic proteins MCL-1 or BCL-xL in a BH3-dependent or independent manner. Since hTERT promotes cellular survival through BAX- or BCL-2-dependent mechanisms (Del Bufalo et al., 2005; Indran et al., 2011; Massard et al., 2006), we examined if hTERT can regulate BAX/BCL-xL or BAK/MCL-1 heterodimer formation; however, these complexes were unaffected by ectopic hTERT expression. Our findings also raise questions regarding the exact role of the BH3 motif in apoptotic cell death. Unlike most BH3-containing proteins that activate or sensitize cell death (Moldoveanu et al., 2014), hTERT is an anti-apoptotic protein. Thus, the discovery of a BH3-like motif has drawn our attention to the inconsistencies in results regarding the role of BH3-only proteins in triggering cell death. Most BH3-containing proteins were previously identified by L-X(3)-G-D sequence motif along with their pro-apoptotic functions. Recently, however, a few BH3-containing proteins were characterized as apoptosis inhibitors after they were reported as BCL-xL interaction partners (Hawley et al., 2012; Thebault et al., 2016). BECN1 was also identified as an atypical BH3-only protein that fails to induce apoptosis and was first isolated as a BCL-2 binding protein (Boya and Kroemer, 2009). To resolve inconsistent findings, Aouacheria and colleagues (Aouacheria et al., 2015) introduced the concept that the BH3 motif is a novel class of short linear motifs (SLiMs) involved in protein-protein interactions and not proapoptotic functions. Although hTERT also contains a BH3-like motif, this motif may weakly interact with anti-apoptotic proteins and thereby constrain their pro-apoptotic activity. Overall, hTERT behaves as an atypical BH3-only protein that does not induce apoptosis. The precise mechanism by which hTERT exerts its non-canonical function in promoting cellular and organismal survival is still enigmatic. However, it is important to note that hTERT has a non-telomeric conserved sequence motif that mediates protein interactions. Transient protein-protein interactions of hTERT, which are not involved in telomere maintenance, may play key roles in many aspects of cellular physiology. Recently, it was revealed that telomerase can regulate autophagy through the mTOR signaling pathway (Ali et al., 2016; Cheng et al., 2015). Additionally, we found that hTERT interacts with BECN1, a BH3-only protein, through a coiled-coil domain important for autophagy induction, suggesting that hTERT may also regulate autophagy through BECN1 interactions. Thus, multiple non-canonical functions of hTERT are likely to be associated with BCL-2 family members and mediated by protein-protein interactions. Identification of direct associations between BCL-2 family proteins and hTERT may aid in understanding the roles of hTERT in novel non-canonical functions, thereby contributing to elucidate the molecular mechanisms of its physiology and pathology. Fig. 1. (A) Sequence alignment of the hTERT BH3-like motif with other BH3 domains of BCL-2 family proteins. Schematic representation of hTERT domains presented at the top. The BH3-like motif is localized in the TEN domain. Conserved hydrophobic residues are marked by asterisks. Characteristics of the amino acids are highlighted in different colors. Red, hydrophobic residues; green, small residues; blue, acidic residues; magenta, basic residues. The putative BH3 sequence is Φ1-Sm-X-X-Φ2(L)-K/R-R-Φ3-G-D-D/E-Φ4-X-X-X-Φ5. Φ, hydrophobic residues; Sm, small residues; X, random amino acids. (B) Sequence homology and phylogenetic analysis from Saccharomyces cerevisiae to humans. (C) Helical wheel plots of the putative BH3 sequence between BIM and hTERT. Hydrophobic and charged residues are indicated by blue and red, respectively. A cluster of hydrophobic residues are depicted by the yellow line. Fig. 2. (A) Co-immunoprecipitation (co-IP) analysis of hTERT and BCL-xL or MCL-1. HEK 293T/17 cells were transfected with the indicated plasmids, followed by co-IP analysis of ectopically expressed hTERT and BCL-xL or MCL-1. (B) Reciprocal co-IP analysis of hTERT and BCL-xL or MCL-1 interactions. The asterisk indicates a nonspecific band. (C) Domain mapping of the interaction between hTERT and MCL-1. HEK 293T/17 cells were transfected with the indicated hTERT truncation mutants, followed by co-IP and Western blot analysis with the indicated antibodies. Mapping of the hTERT domain revealed that both TEN and RT domains are important for MCL-1 interaction. The asterisk indicates a nonspecific band. (D) Co-IP of MCL-1 and hTERT BH3 mutants. hTERT BH3 mutants (L141A, G145E, and D146A) were generated by point mutations at key residues of the BH3 core motif. The hTERT BH3 mutants did not fully disrupt interactions with MCL-1. Fig. 3. (A, B) Co-IP of hTERT and BAD or BECN1. hTERT can bind to BH3-only proteins BAD and BECN1. (C) Domain mapping of the interaction between hTERT and BECN1. A schematic representation of BECN1 domains is shown at the top. HEK 293T/17 cells were transfected with the indicated plasmids, followed by co-IP assays with anti-FLAG beads. The indicated antibodies were used to detect bound proteins eluted from the beads. The coiled-coil domain of BECN1 is important for hTERT interaction. CCD, coiled-coil domain; ECD, evolutionarily conserved domain. Fig. 4. (A) Effects of hTERT BH3 mutants on telomerase activity. 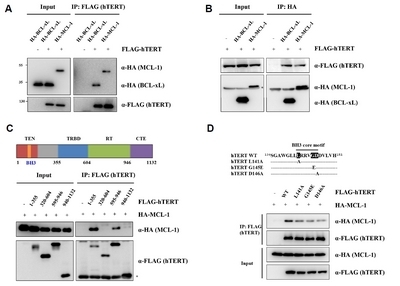 Telomerase-negative U2OS cells were transiently transfected with expression plasmids encoding FLAG-tagged wild-type (WT) of hTERT, MCL-1 binding-defective mutants (L141A, G145E, D146A), or an hTERT BH3 deletion mutant. Telomerase activity was detected by TRAP assay. IC, internal control of the TRAP assay; NC, negative control without telomerase extract. 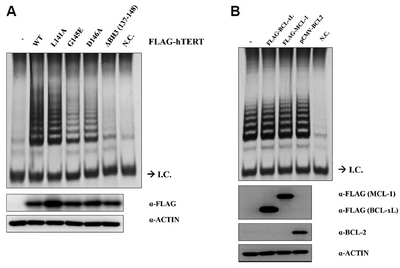 (B) Telomerase activity by anti-apoptotic proteins BCL-xL and MCL-1 using TRAP analysis. HeLa cells were transiently transfected with the indicated constructs. Transient expression of antiapoptotic BCL-2 members did not affect telomerase activity. Fig. 5. (A) Staurosporine (STS) treatment for the indicated time points downregulated MCL-1 expression. Western blot analysis was performed for MCL-1, BCL-xL, and BAX protein expression over a 6-h time course following treatment with STS. After 4 h of treatment, STS significantly decreased protein levels of MCL-1 but not BCL-xL or BAX. (B) Quantitative reverse transcription PCR (qRT-PCR) analysis of MCL-1 during STS treatment. (C) Effects of the proteasome inhibitor MG132 on MCL-1 degradation. (D) Western blot analysis of hTERT-expressing HEK 293T/17 cells after STS treatment. There were no significant changes in MCL-1 protein levels by hTERT overexpression. Fig. 6. (A) Co-IP of BAX and BCL-xL in hTERT-overexpressing HEK 293T/17 cells. Cells were co-transfected with FLAG-BCL-xL and MYC-hTERT, and then lysed in either Triton X-100 or CHAPS buffer. FLAG-BCL-xL was immunoprecipitated with anti-FLAG beads, followed by western blot analysis with the indicated antibodies. No significant differences in BAX/BCL-xL ratios were observed after hTERT overexpression. (B) Co-IP of BAX and BCL-xL with BAD and hTERT overexpression. The cells were lysed with detergent containing Triton X-100. BAD can disrupt BAX/BCL-xL heterodimers, but hTERT did not affect the BAD-dependent BAX/BCL-xL complex ratios. (C) Co-IP experiment of BAK and MCL-1 with hTERT overexpression. (D) Co-IP analysis of BCL-xL and BECN1 with hTERT overexpression. The BECN1/BCL-xL interaction is not altered by hTERT overexpression. Ahmed, S., Passos, J.F., Birket, M.J., Beckmann, T., Brings, S., Peters, H., Birch-Machin, M.A., von Zglinicki, T., and Saretzki, G. (2008). Telomerase does not counteract telomere shortening but protects mitochondrial function under oxidative stress. J Cell Sci. 121, 1046-1053. Ali, M., Devkota, S., Roh, J.I., Lee, J., and Lee, H.W. (2016). Telomerase reverse transcriptase induces basal and amino acid starvation-induced autophagy through mTORC1. Biochem Biophys Res Commun. 478, 1198-1204. Aouacheria, A., Rech de Laval, V., Combet, C., and Hardwick, J.M. (2013). Evolution of Bcl-2 homology motifs: homology versus homoplasy. Trends Cell Biol. 23, 103-111. Aouacheria, A., Combet, C., Tompa, P., and Hardwick, J.M. (2015). Redefining the BH3 Death Domain as a ‘Short Linear Motif’. Trends Biochem Sci. 40, 736-748. Blackburn, E.H. (1992). Telomerases. Ann Rev Biochem. 61, 113-129. Blasco, M.A., Lee, H.W., Hande, M.P., Samper, E., Lansdorp, P.M., DePinho, R.A., and Greider, C.W. (1997). Telomere shortening and tumor formation by mouse cells lacking telomerase RNA. Cell. 91, 25-34. Boya, P., and Kroemer, G. (2009). Beclin 1: a BH3-only protein that fails to induce apoptosis. Oncogene. 28, 2125-2127. Cao, Y., Li, H., Deb, S., and Liu, J.P. (2002). TERT regulates cell survival independent of telomerase enzymatic activity. Oncogene. 21, 3130-3138. Cheng, H., Fan, X., Lawson, W.E., Paueksakon, P., and Harris, R.C. (2015). Telomerase deficiency delays renal recovery in mice after ischemia-reperfusion injury by impairing autophagy. Kidney Int. 88, 85-94. Chipuk, J.E., and Green, D.R. (2008). How do BCL-2 proteins induce mitochondrial outer membrane permeabilization?. Trends Cell Biol. 18, 157-164. Chipuk, J.E., Moldoveanu, T., Llambi, F., Parsons, M.J., and Green, D.R. (2010). The BCL-2 family reunion. Mol Cell. 37, 299-310. Choi, Y.B., Sandford, G., and Nicholas, J. (2012). Human herpesvirus 8 interferon regulatory factor-mediated BH3-only protein inhibition via Bid BH3-B mimicry. PLoS Pathogens. 8, e1002748. Cole, C., Barber, J.D., and Barton, G.J. (2008). The Jpred 3 secondary structure prediction server. Nucleic Acids Res. 36, W197-201. Czabotar, P.E., Lee, E.F., van Delft, M.F., Day, C.L., Smith, B.J., Huang, D.C., Fairlie, W.D., Hinds, M.G., and Colman, P.M. (2007). 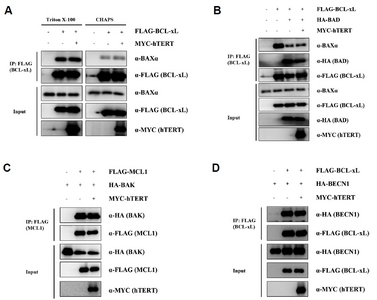 Structural insights into the degradation of Mcl-1 induced by BH3 domains. Proc Natl Acad Sci USA. 104, 6217-6222. Czabotar, P.E., Lessene, G., Strasser, A., and Adams, J.M. (2014). Control of apoptosis by the BCL-2 protein family: implications for physiology and therapy. Nat Rev Mol Cell Biol. 15, 49-63. Del Bufalo, D., Rizzo, A., Trisciuoglio, D., Cardinali, G., Torrisi, M.R., Zangemeister-Wittke, U., Zupi, G., and Biroccio, A. (2005). Involvement of hTERT in apoptosis induced by interference with Bcl-2 expression and function. Cell Death Differ. 12, 1429-1438. Edlich, F., Banerjee, S., Suzuki, M., Cleland, M.M., Arnoult, D., Wang, C., Neutzner, A., Tjandra, N., and Youle, R.J. (2011). Bcl-x(L). retrotranslocates Bax from the mitochondria into the cytosol. Cell. 145, 104-116. Haendeler, J., Hoffmann, J., Brandes, R.P., Zeiher, A.M., and Dimmeler, S. (2003). Hydrogen peroxide triggers nuclear export of telomerase reverse transcriptase via Src kinase family-dependent phosphorylation of tyrosine 707. Mol Cell Biol. 23, 4598-4610. Haendeler, J., Drose, S., Buchner, N., Jakob, S., Altschmied, J., Goy, C., Spyridopoulos, I., Zeiher, A.M., Brandt, U., and Dimmeler, S. (2009). Mitochondrial telomerase reverse transcriptase binds to and protects mitochondrial DNA and function from damage. Arterioscler Thromb Vasc Biol. 29, 929-935. Hardwick, J.M., and Soane, L. (2013). Multiple functions of BCL-2 family proteins. Cold Spring Harb Perspect Biol. 5. Harris, R.C., and Cheng, H. (2016). Telomerase, autophagy and acute kidney injury. Nephron. 134, 145-148. Hawley, R.G., Chen, Y., Riz, I., and Zeng, C. (2012). An integrated bioinformatics and computational biology approach identifies new BH3-only protein candidates. Open Biol J. 5, 6-16. Herman, M.D., Nyman, T., Welin, M., Lehtio, L., Flodin, S., Tresaugues, L., Kotenyova, T., Flores, A., and Nordlund, P. (2008). Completing the family portrait of the anti-apoptotic Bcl-2 proteins: crystal structure of human Bfl-1 in complex with Bim. FEBS Lett. 582, 3590-3594. Hsu, Y.T., and Youle, R.J. (1997). Nonionic detergents induce dimerization among members of the Bcl-2 family. J Biol Chem. 272, 13829-13834. Iglesias-Serret, D., Pique, M., Gil, J., Pons, G., and Lopez, J.M. (2003). 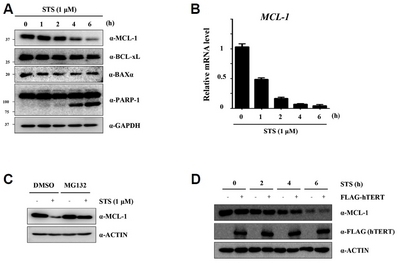 Transcriptional and translational control of Mcl-1 during apoptosis. Arch Biochem Biophys. 417, 141-152. Indran, I.R., Hande, M.P., and Pervaiz, S. (2011). hTERT overexpression alleviates intracellular ROS production, improves mitochondrial function, and inhibits ROS-mediated apoptosis in cancer cells. Cancer Res. 71, 266-276. Jacobs, S.A., Podell, E.R., and Cech, T.R. (2006). Crystal structure of the essential N-terminal domain of telomerase reverse transcriptase. Nat Struct Mol Biol. 13, 218-225. Kang, H.J., Choi, Y.S., Hong, S.B., Kim, K.W., Woo, R.S., Won, S.J., Kim, E.J., Jeon, H.K., Jo, S.Y., and Kim, T.K. (2004). Ectopic expression of the catalytic subunit of telomerase protects against brain injury resulting from ischemia and NMDA-induced neurotoxicity. J Neurosci. 24, 1280-1287. Kim, N.W., Piatyszek, M.A., Prowse, K.R., Harley, C.B., West, M.D., Ho, P.L., Coviello, G.M., Wright, W.E., Weinrich, S.L., and Shay, J.W. (1994). Specific association of human telomerase activity with immortal cells and cancer. Science. 266, 2011-2015. Koh, C.M., Khattar, E., Leow, S.C., Liu, C.Y., Muller, J., Ang, W.X., Li, Y., Franzoso, G., Li, S., and Guccione, E. (2015). Telomerase regulates MYC-driven oncogenesis independent of its reverse transcriptase activity. J Clin Invest. 125, 2109-2122. Kvansakul, M., and Hinds, M.G. (2013). Structural biology of the Bcl-2 family and its mimicry by viral proteins. Cell Death Dis. 4, e909. Landberg, G., Nielsen, N.H., Nilsson, P., Emdin, S.O., Cajander, J., and Roos, G. (1997). Telomerase activity is associated with cell cycle deregulation in human breast cancer. Cancer Res. 57, 549-554. Lee, J., Sung, Y.H., Cheong, C., Choi, Y.S., Jeon, H.K., Sun, W., Hahn, W.C., Ishikawa, F., and Lee, H.W. (2008). TERT promotes cellular and organismal survival independently of telomerase activity. Oncogene. 27, 3754-3760. Lin, C.Y., Wu, H.Y., Wang, P.L., and Yuan, C.J. (2010). Mammalian Ste20-like protein kinase 3 induces a caspase-independent apoptotic pathway. Int J Biochem Cell Biol. 42, 98-105. Longo, P.A., Kavran, J.M., Kim, M.S., and Leahy, D.J. (2013). Transient mammalian cell transfection with polyethylenimine (PEI). Methods Enzymol. 529, 227-240. Maida, Y., Yasukawa, M., Furuuchi, M., Lassmann, T., Possemato, R., Okamoto, N., Kasim, V., Hayashizaki, Y., Hahn, W.C., and Masutomi, K. (2009). An RNA-dependent RNA polymerase formed by TERT and the RMRP RNA. Nature. 461, 230-235. Maiuri, M.C., Criollo, A., Tasdemir, E., Vicencio, J.M., Tajeddine, N., Hickman, J.A., Geneste, O., and Kroemer, G. (2007a). BH3-only proteins and BH3 mimetics induce autophagy by competitively disrupting the interaction between Beclin 1 and Bcl-2/Bcl-X(L). Autophagy. 3, 374-376. Maiuri, M.C., Le Toumelin, G., Criollo, A., Rain, J.C., Gautier, F., Juin, P., Tasdemir, E., Pierron, G., Troulinaki, K., and Tavernarakis, N. (2007b). Functional and physical interaction between Bcl-X(L) and a BH3-like domain in Beclin-1. EMBO J. 26, 2527-2539. Mandal, M., and Kumar, R. (1997). Bcl-2 modulates telomerase activity. J Biol Chem. 272, 14183-14187. Massard, C., Zermati, Y., Pauleau, A.L., Larochette, N., Metivier, D., Sabatier, L., Kroemer, G., and Soria, J.C. (2006). hTERT: a novel endogenous inhibitor of the mitochondrial cell death pathway. Oncogene. 25, 4505-4514. Matsunaga, K., Saitoh, T., Tabata, K., Omori, H., Satoh, T., Kurotori, N., Maejima, I., Shirahama-Noda, K., Ichimura, T., and Isobe, T. (2009). Two Beclin1-binding proteins Atg14L and Rubicon, reciprocally regulate autophagy at different stages. Nat Cell Biol. 11, 385-396. Moldoveanu, T., Follis, A.V., Kriwacki, R.W., and Green, D.R. (2014). Many players in BCL-2 family affairs. Trends Biochem Sci. 39, 101-111. Nijhawan, D., Fang, M., Traer, E., Zhong, Q., Gao, W., Du, F., and Wang, X. (2003). Elimination of Mcl-1 is required for the initiation of apoptosis following ultraviolet irradiation. Genes Dev. 17, 1475-1486. Perciavalle, R.M., Stewart, D.P., Koss, B., Lynch, J., Milasta, S., Bathina, M., Temirov, J., Cleland, M.M., Pelletier, S., and Schuetz, J.D. (2012). Anti-apoptotic MCL-1 localizes to the mitochondrial matrix and couples mitochondrial fusion to respiration. Nat Cell Biol. 14, 575-583. Rahman, R., Latonen, L., and Wiman, K.G. (2005). hTERT antagonizes p53-induced apoptosis independently of telomerase activity. Oncogene. 24, 1320-1327. Reed, J.C. (1997). Double identity for proteins of the Bcl-2 family. Nature. 387, 773-776. Rodolfo, C., Mormone, E., Matarrese, P., Ciccosanti, F., Farrace, M.G., Garofano, E., Piredda, L., Fimia, G.M., Malorni, W., and Piacentini, M. (2004). Tissue transglutaminase is a multifunctional BH3-only protein. J Biol Chem. 279, 54783-54792. Rooswinkel, R.W., van de Kooij, B., de Vries, E., Paauwe, M., Braster, R., Verheij, M., and Borst, J. (2014). Antiapoptotic potency of Bcl-2 proteins primarily relies on their stability, not binding selectivity. Blood. 123, 2806-2815. Santos, J.H., Meyer, J.N., Skorvaga, M., Annab, L.A., and Van Houten, B. (2004). Mitochondrial hTERT exacerbates free-radical-mediated mtDNA damage. Aging Cell. 3, 399-411. Saretzki, G. (2009). Telomerase, mitochondria and oxidative stress. Exp Gerontol. 44, 485-492. Schmidt, J.C., Dalby, A.B., and Cech, T.R. (2014). Identification of human TERT elements necessary for telomerase recruitment to telomeres. eLife, 3. Shamas-Din, A., Brahmbhatt, H., Leber, B., and Andrews, D.W. (2011). BH3-only proteins: orchestrators of apoptosis. Biochim Biophys Acta. 1813, 508-520. Sharma, N.K., Reyes, A., Green, P., Caron, M.J., Bonini, M.G., Gordon, D.M., Holt, I.J., and Santos, J.H. (2012). Human telomerase acts as a hTR-independent reverse transcriptase in mitochondria. Nucleic Acids Res. 40, 712-725. Shay, J.W., Zou, Y., Hiyama, E., and Wright, W.E. (2001). Telomerase and cancer. Hum Mol Genet. 10, 677-685. Steczkiewicz, K., Zimmermann, M.T., Kurcinski, M., Lewis, B.A., Dobbs, D., Kloczkowski, A., Jernigan, R.L., Kolinski, A., and Ginalski, K. (2011). Human telomerase model shows the role of the TEN domain in advancing the double helix for the next polymerization step. Proc Natl Acad Sci USA. 108, 9443-9448. Tan, K.O., Tan, K.M., Chan, S.L., Yee, K.S., Bevort, M., Ang, K.C., and Yu, V.C. (2001). MAP-1, a novel proapoptotic protein containing a BH3-like motif that associates with Bax through its Bcl-2 homology domains. J Biol Chem. 276, 2802-2807. Thebault, S., Agez, M., Chi, X., Stojko, J., Cura, V., Telerman, S.B., Maillet, L., Gautier, F., Billas-Massobrio, I., and Birck, C. (2016). TCTP contains a BH3-like domain, which instead of inhibiting, activates Bcl-xL. Sci Rep. 6, 19725. Wang, T., Xue, Y., Wang, M., and Sun, Q. (2012). Silencing of the hTERT gene through RNA interference induces apoptosis via bax/bcl-2 in human glioma cells. Oncol Rep. 28, 1153-1158. Westphal, D., Kluck, R.M., and Dewson, G. (2014). Building blocks of the apoptotic pore: how Bax and Bak are activated and oligomerize during apoptosis. Cell Death Differ. 21, 196-205. Wirawan, E., Lippens, S., Vanden Berghe, T., Romagnoli, A., Fimia, G.M., Piacentini, M., and Vandenabeele, P. (2012). Beclin1: a role in membrane dynamics and beyond. Autophagy. 8, 6-17. Xia, J., Peng, Y., Mian, I.S., and Lue, N.F. (2000). Identification of functionally important domains in the N-terminal region of telomerase reverse transcriptase. Mol Cell Biol. 20, 5196-5207. Xie, Z., Xiao, Z., and Wang, F. (2017). Hepatitis C virus nonstructural 5A protein (HCV-NS5A) inhibits hepatocyte apoptosis through the NF-kappab/miR-503/bcl-2 pathway. Mol Cells. 40, 202-210. Yang, E., Zha, J., Jockel, J., Boise, L.H., Thompson, C.B., and Korsmeyer, S.J. (1995). Bad, a heterodimeric partner for Bcl-XL and Bcl-2, displaces Bax and promotes cell death. Cell. 80, 285-291. Zha, J., Harada, H., Osipov, K., Jockel, J., Waksman, G., and Korsmeyer, S.J. (1997). BH3 domain of BAD is required for heterodimerization with BCL-XL and pro-apoptotic activity. J Biol Chem. 272, 24101-24104. Zhang, Z., Yu, L., Dai, G., Xia, K., Liu, G., Song, Q., Tao, C., Gao, T., and Guo, W. (2017). Telomerase reverse transcriptase promotes chemoresistance by suppressing cisplatin-dependent apoptosis in osteosarcoma cells. Sci Rep. 7, 7070.